Isabelle Huppert in "Story of Women"
Story of Women is a 1988 film by the French director Claude Chabrol. The film is based upon the true story of the last woman to be executed by guillotine. It stars Isabelle Huppert as Marie, in a great performance as one of the most complex characters in any film I’ve ever seen. As films go, this one is a difficult but worthwhile read - I expect there are as many interpretations or reactions as there are people who've seen it. I'm still absorbing and thinking abut it even a few weeks after seeing it, so if you haven't seen it, be warned before you read any further - this review has more spoiler alerts than usual. If you have, I'd love to hear from you and discuss your interpretation. The film takes place during the German occupation of France. We see Marie with her two small children, struggling to get by, living in a tiny apartment in a crowded tenement. 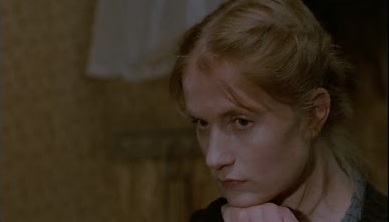 Her husband, Paul (played by Francois Cluzet), is a prisoner of war who one day shows up, having been released and diagnosed as “shell shocked.” Marie’s reaction to having her husband home is icy, to say the least. He’s just one more mouth to feed, just a huge inconvenience, and she refuses to sleep with him. Before her husband returns home, Marie helps a neighbor woman have an abortion. The woman thanks Marie by purchasing a phonograph that Marie enjoys immensely. Marie recognizes the earning potential for an abortionist in the tumultuous times. She meets another woman, who is doing quite well as a prostitute. She makes an arrangement with the prostitute, performing abortions for hookers the woman refers to her. Marie begins charging higher and higher prices for her services, business is flourishing, and soon she and her family move out of the tiny apartment into a bigger place. Story of Women is not your typical feminist film. The character of Marie isn’t very likeable, and as she becomes more successful at her new trade, she becomes more brazen in her "immorality." She takes a much younger Nazi as her lover, and hires a new live-in housekeeper to help her perform the abortions and to sleep with her husband, who she has no use for. As Marie, Huppert is terrific. In the opening scenes of the film, with Marie trying to feed her children, we become attached to her, sympathetic to her plight. This is why her subsequent behavior as a capitalist gone mad is so shocking. 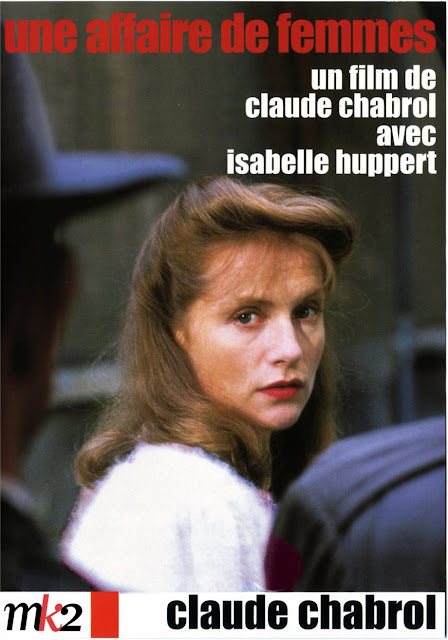 In his direction, Chabrol presents the elements of the story objectively, and Huppert’s performance is remarkable in the distances it maintains. We’re never really clear about what’s going on inside her. Huppert is strikingly beautiful, and you know there’s a lot going on beneath her surface, but neither Chabrol nor Huppert reveal much about exactly what that might be. Her husband, Paul, is another fascinating character, and Cluzet’s performance is also great. He is essentially worthless and in the way, but Cluzet fleshes him out, and we see a man who is a shell of what he used to be. Yet he still loves his children and tries to be a good father, even when, as a husband, he’s emasculated by Marie’s ever increasing contempt and bold behavior. The scenes showing Marie’s arrest and sentencing seem to be from a different film. They don’t work as well because suddenly we are asked to see her as simple, and a victim. Whatever she is in the rest of the film, it isn’t victim. So what are we supposed to get out of this movie? It’s hard to tell, because Chabrol doesn’t reveal much beyond “the facts” of the story. For example, abortion is treated evenly; necessary and inevitable during a time when husbands and wives are separated by war, and tragic when one of the procedures goes wrong and ends horribly. This is what makes the film so great – it leaves us with a lot to think about, and demands that the audience make up its own mind about whether Marie is a heroine or villain; whether we should sympathize with her as a victim or admire her as an opportunistic capitalist. She’s more than a survivor--she’s a survivor with drive and ambition, traits we are taught to admire in men. The movie asks us to reexamine our attitudes and ask if these really are admirable traits in either men or women. Story of Women makes the viewer think, and now that I’ve had a couple of days to absorb it all, here’s what I think it’s really about. It’s about how women, in a world where men are absent or ineffective, will take control of their lives, and in doing so, become subject to the same obsessive and amoral behavior as men. It’s about an individual who rises above her circumstance and loses sight of what is right or wrong. I think another clue to the intent of the film is in the title's use of the plural women when it's really the story of one woman. What Chabrol might be going after is the fact that a woman has to be so many more things than the men of the legal system who determine Hupert's fate. Ultimately, it's men who determine what is legal and illegal, moral and immoral, right and wrong, for women in all aspects of their lives, even those pertaining to their own bodies. It's the same hypocrisy we see today, in a world where a woman's access to contraception is under attack at the same time drugs like Viagra and Cialis are made easily available to men everywhere. The French government comes across as hypocritical and ineffective. They are, at the time, as one of the characters puts it, a “conquered nation.” They, in turn, crack down on “immoral acts,” in an effort to reestablish and maintain their grip on the public. Marie is given the death sentence, even though historically women were almost never given the guillotine. It’s a decision made for political reasons, to set an example. In effect, the government aborts Marie’s life, even though it bears responsibility for creating the environment in which there was such great demand for the services she provided. Men and women, morality and immorality. governments and individuals, are all examined evenly, deeply, and objectively. If you're looking for something provocative but intelligent with depth and substance, something to challenge you politically and philosophically without pandering, Story of Women manages to be all of the above and more - ultimately, it's a great work of art.